ESPN.com is reporting that Monday MRI results on cornerback Prince Amukamara’s pectoral muscle were encouraging. There is a possibility that he could play on Sunday depending on how well he practices this week. 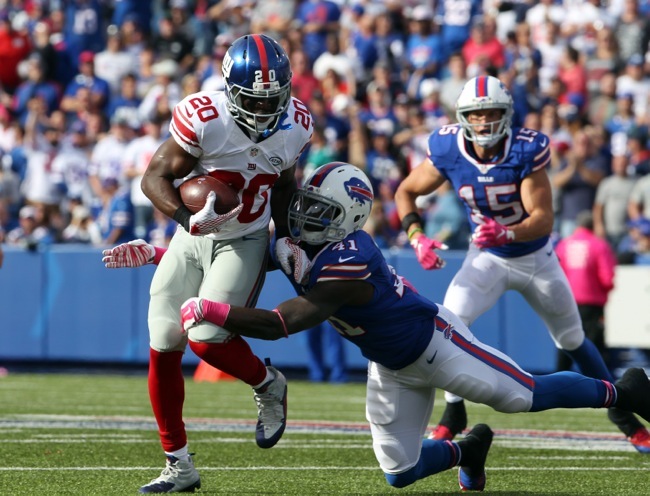 Amukamara has missed three games since suffering the injury against the San Francisco 49ers on October 11. The New York Daily News is reporting that running back Orleans Darkwa suffered a badly bruised tailbone in Sunday’s loss against the New Orleans Saints. He may not be able to practice on Wednesday but he is hopeful that he can play on Sunday. The Daily News is also reporting that the neck injury suffered by tight end Larry Donnell in the game against the New Orleans Saints is not considered serious. He also underwent an MRI on Monday. Donnell still has some soreness in the neck however. The New York Giants have signed tight end Matt LaCosse to the Practice Squad. LaCosse was originally signed by the Giants as an undrafted rookie free agent after the 2015 NFL Draft. The Giants waived/injured him on August 1st with a hamstring injury. He then spent some time with the Jets before being waived before the season started. Because he was waived/injured, the Giants had to wait until after Week 8 to re-sign him. The Giants had a Practice Squad vacancy due to the promotion of linebacker James Morris to the 53-man roster from the Practice Squad late last week. The NFL trade deadline passed at 4:00PM EST with no moves being made by the New York Giants and most of the rest of the NFL. As is usually the case, the Giants worked out a number of street free agents on Tuesday. Those reportedly working out for the team included tight ends James Casey, Adrien Robinson, and Matt LaCosse. The team signed LaCosse. The audio of Tuesday’s WFAN Radio interview with running back Rashad Jenning’s is available on CBS New York’s website. In addition, the audio of Tuesday’s ESPN Radio interview with Jennings is available on ESPN.com. A sights and sounds video from the Giants’ 52-49 loss to the New Orleans Saints is now available at Giants.com. The Giants and Saints combined for 1,024 yards (608 by the Saints and 416 by Giants), the second-most ever in a Giants game. The record of 1,042 yards was set on November 28, 2011, in the previous game the Giants played in the Superdome. The 834 combined passing yards were the highest total ever in a Giants game. The Giants and Saints combined for 63 first downs, which is the second-highest total in NFL history. Seattle and Kansas City set the mark with 64 first downs in 2002. The winning team in the last four Giants-Saints games scored 48, 49, 52, and 52 points. It is the first time in NFL history two teams played four consecutive games in which the winner scored at least 48 points in each of them. In the Giants last four visits to the Superdome, the Giants have allowed 45, 48, 49, and 52 points to become the first team ever to give up at least 45 points in the same stadium in four consecutive visits. In Tom Coughlin’s 12 seasons and 195 games (including playoffs) as head coach, the Giants have allowed 48 or more points three times – each time in New Orleans. The Saints scored 10 points in the game’s final 36 seconds. It is the first time since the 1970 merger the Giants allowed 10 points in the final 36 seconds of a game. QB Drew Brees completed 18 consecutive passes on Sunday, which ties the longest single-game streak against the Giants. Jim Everett of the Los Angeles Rams had a streak of 18 in a row on November 12, 1989. The Giants lead the NFL with a plus-11 turnover differential, their highest differential since they finished the 2012 season at plus-14. 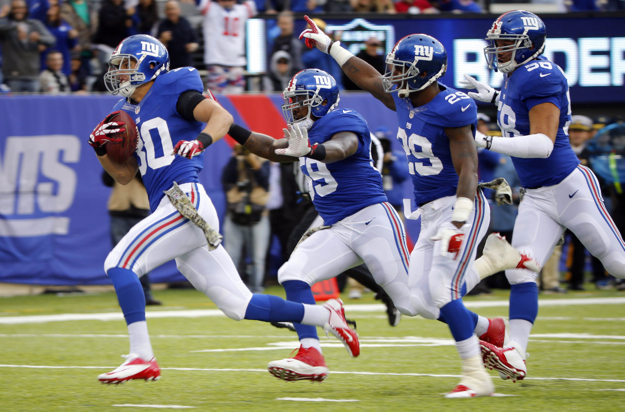 The Giants have scored 215 points this season – 108 in the first half, and 107 in the second half. The players return to practice on Wednesday to start preparing for Sunday’s game against the Tampa Bay Buccaneers. 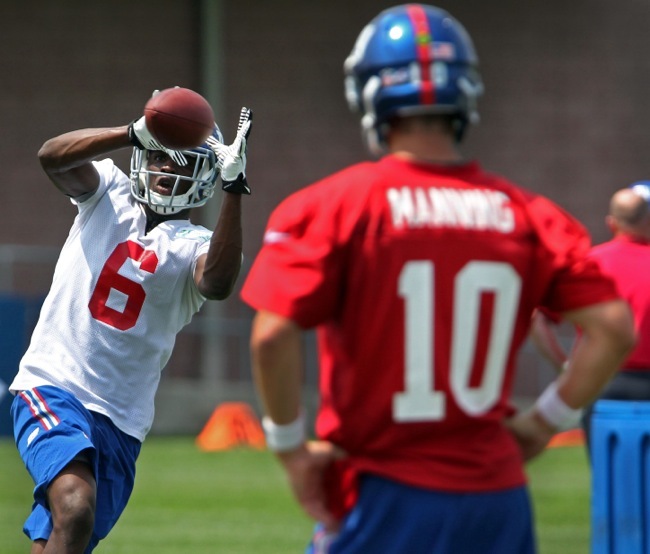 The New York Giants have signed wide receiver Myles White from the team’s Practice Squad to the 53-man roster. White fills the vacancy created when tight end Daniel Fells was placed on season-ending Injured Reserve with a MRSA staph infection. The Giants signed White to the Practice Squad after he was waived by the Green Bay Packers in September 2015. White was originally signed as an undrafted rookie free agent by the Packers after the 2013 NFL Draft. White played in seven games as a rookie, catching nine passes for 66 yards. He spent the 2014 season on Green Bay’s Practice Squad. White led the Packers with 16 receptions for 157 yards and two touchdowns in the 2015 preseason. He is an average-sized receiver with good speed. Myles White: "I've been in this offense for three years now, working with Coach Mac [Ben McAdoo] my rookie year, so I know what he expects." The Giants also re-signed wide receiver Julian Talley to the Practice Squad and added tight end Dominique Jones to the Practice Squad. Talley had been released from the team’s Practice Squad on September 30. 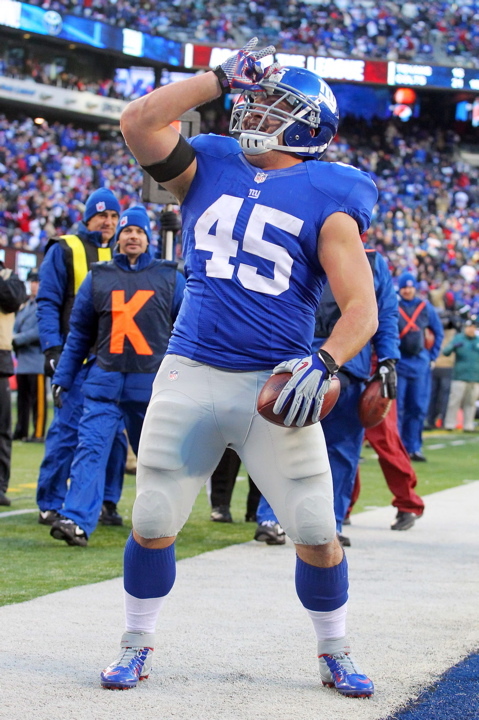 Talley was originally signed as an undrafted rookie free agent by the Giants after the 2012 NFL Draft. Talley spent most of the 2013 and 2014 seasons on the team’s Practice Squad, although he did play in two games each season. He does not yet have an NFL catch. Talley is a tall, thin receiver with good overall athletic ability. He lacks ideal speed, but is smooth and fluid with good hands. Talley has gotten better each year. Jones is a well-traveled journeyman who has spent time with the Sacramento Mountain Lions (2011), Reading Express (2012), Indianapolis Colts (2012 and 2013), Miami Dolphins (2012), Kansas City Chiefs (2013), Buffalo Bills (2014), Denver Broncos (2014–2015), and Baltimore Ravens (2015). He has played in 13 NFL regular-season games with three starts, accruing just three catches for 42 yards. Jones has good size (6’3”, 270 pounds). 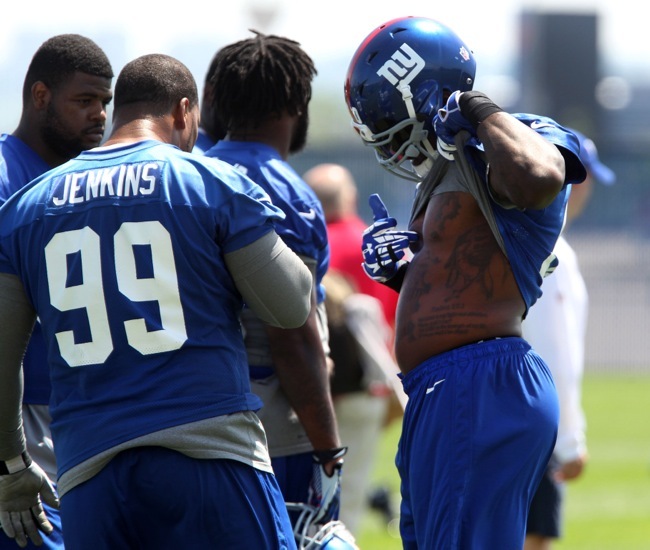 As normal, the New York Giants held workouts for a number of unsigned players on Tuesday. Those who worked out for the team included quarterback Cody Fajardo; tight ends Adrien Robinson, Cameron Clear, Dominique Jones, and Brian Leonhardt; and defensive end/tight end Jake Bequette. Jones was signed to the Practice Squad. At the request of both the NFL and the NFL Players Association, the Giants held a team meeting on Wednesday to address player concerns about the MRSA staph infection that has ended tight end Daniel Fells’ season. The Giants had their team facilities professionally scrubbed to contain any possible spread to other players and team officials. “We had (Senior Vice President of Medical Services) Ronnie Barnes, we had team doctors, we had the person in charge of our facility in here to talk about the way the cleaning process is normally underway, and what we have done in addition to that, as well,” said Head Coach Tom Coughlin. “So the players asked a couple of questions, very good questions…We still do not know the reason for the infection or where it came from…I think most of the questions got answered this morning. The guys seemed to be able to go right back to work. WR Victor Cruz (calf), LT Will Beatty (pectoral – on PUP), DE Robert Ayers (hamstring), DE George Selvie (calf), LB Devon Kennard (hamstring), CB Jayron Hosley (concussion), and CB Trumaine McBride (groin) did not practice on Wednesday. TE Jerome Cunningham (knee) was limited to individual drills. LT Ereck Flowers (ankle) and DT Markus Kuhn (knee) fully practiced. The audio of Tuesday’s WFAN Radio interview with LB Jon Beason is available at CBS New York’s website. The Giants practice on Thursday and hold physical recovery cycles on Friday in advance of Sunday’s home game against the San Francisco 49ers. 2014 YEAR IN REVIEW: As the New York Giants entered training camp in July 2014, the tight end position appeared to be a pending disaster. The Giants had parted ways with the disappointing Brandon Myers and jack-of-all-trades, master-of-none Bear Pascoe. The only returning players were Larry Donnell (16 games, 3 catches in his two NFL seasons) and Adrien Robinson (3 games, no catches in his two seasons), both of whom had demonstrated very little to date. The Giants had added Kellen Davis (unrestricted free agent from the Seahawks), Daniel Fells (who was out of football in 2013), and Xavier Grimble (undrafted rookie free agent). 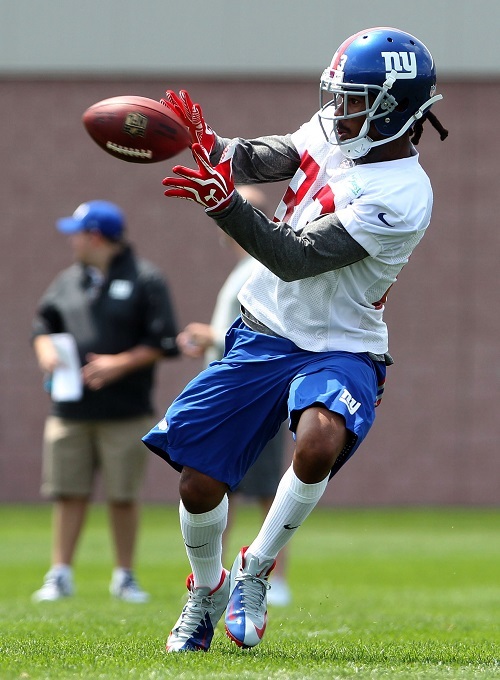 Late in training camp, the Giants also signed Jerome Cunningham (who was out of football in 2013). Few predicted correctly that Donnell would win the starting job followed by Fells as the #2 tight end and Robinson as the #3 tight end. Cunningham was also signed to the Practice Squad. Overall, while the tight end was not a position of strength for the 2014 New York Giants, it certainly was not the mess many had expected. Donnell had a breakout year as a receiver. He finished tied for 9th in the NFL among tight ends in terms of catches (63), 13th in terms of yards (623), and tied for 7th in terms of touchdowns (6). Blocking is not a strength of his game, but Donnell appears to be an ascending player with enough physical talent to get better. Fells proved to be less dynamic, but was more reliable as a blocker. And he did chip in with four touchdowns. Robinson remained buried on the depth chart, but at least he finally saw some playing time and caught his first NFL touchdown pass. ADDITIONS/SUBTRACTIONS: The Giants signed undrafted rookie free agents Matt LaCosse and Will Tye after the 2015 NFL Draft. TRAINING CAMP STORY LINES: The main focus will be on Larry Donnell and whether or not he can take another major leap forward in his development. He jumped from a career 3-catch target to the NFL’s 9th-leading receiving tight end in one season. But Donnell needs to improve his consistency, blocking, and ball security. The good news is he knows that and has been working hard to improve his overall game. A potential fly in the ointment is that Donnell missed most of the spring work with Achilles tendinitis. Assuming Donnell gets and stays healthy, the other story line is which tight ends will round out the unit. Fells is the steady but unspectacular leader of the group. Cunningham really flashed as a receiver during spring practices. Robinson also made some noise in the spring and LaCosse and Tye appear to have more talent than your typical rookie free agents. ON THE BUBBLE: Ideally, the Giants would probably like to carry four tight ends, but three is more likely. Barry injury, the only sure bet is Donnell. Fells, Robinson, Cunningham, LaCosse and Tye are probably fighting for two roster spots. PREDICTIONS: I like this group of tight ends more than most. If Donnell’s Achilles tendinitis isn’t a problem, I truly think he has the ability to develop into one of the better receiving tight ends in the NFL. He looked like a budding star in his Week 4, three-touchdown performance against the Washington Redskins. Donnell can do it. He has an excellent combination of size (6’6”, 265 pounds), athletic ability, and hands. I love the way he adjusts to the football for a big man. He’s a match-up problem for linebackers. So is Jerome Cunningham, but for different reasons. Cunningham is smaller (6’3”, 250 pounds), but even faster and more athletic. He can be a match-up problem for safeties. There were whispers about him being pretty darn good as a Practice Squad player last year and his performance in the spring was impressive. What the group seems to be lacking is someone who excels at blocking. Fells is the most consistent and reliable. But he may be pressed by Robinson, provided Robinson finally “gets it” in his fourth year. I also have a feeling that the Giants are going to like what they see in LaCosse and Tye. FINAL DEPTH CHART: Donnell remains the starter, but Cunningham is going to press for serious playing time as more of an H-Back type tight end. Ben McAdoo will find a role for him in his TE-centric offense. The difficult decision here for me is Robinson versus Fells. I think Robinson will do enough in camp to convince the Giants to keep their 3-year investment. But if Robinson continues to falter, Fells retains his job and provides leadership. While the Practice Squad may be the most realistic option for both LaCosse and Tye, if one excels at blocking, he has a shot at the 53-man roster. Giants.com Video Tribute to Ann Mara: A video tribute to former New York Giants co-owner Ann Mara is available at Giants.com. 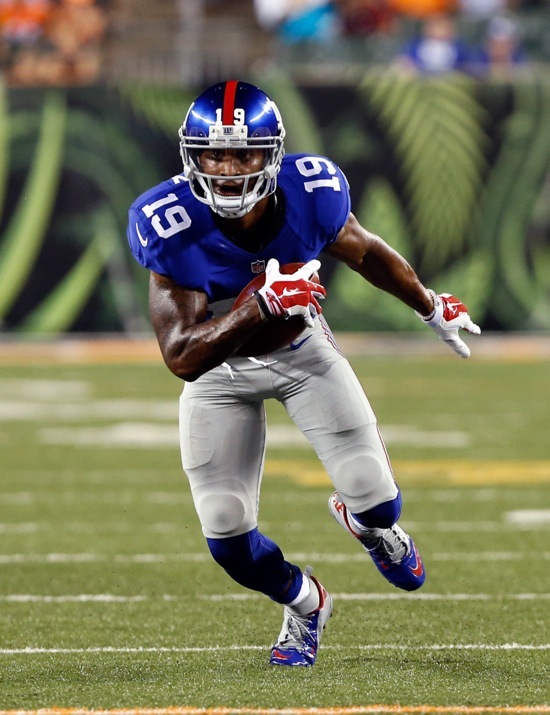 As the New York Giants entered training camp in July 2014, the tight end position appeared to be a pending disaster. The Giants had parted ways with the disappointing Brandon Myers and jack-of-all-trades, master-of-none Bear Pascoe. The only returning players were Larry Donnell (16 games, 3 catches in his two NFL seasons) and Adrien Robinson (3 games, no catches in his two seasons), both of whom had demonstrated very little to date. The Giants had only added Kellen Davis (unrestricted free agent from the Seahawks), Daniel Fells (who was out of football in 2013), and Xavier Grimble (undrafted rookie free agent). 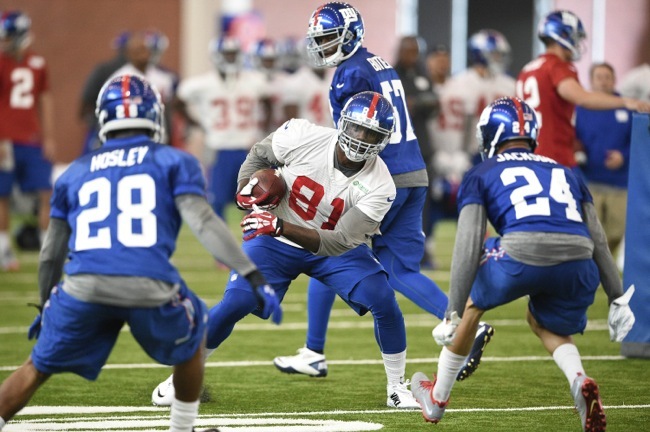 Late in training camp, the Giants also signed Jerome Cunningham (who was out of football in 2013). The only tight ends drafted by the Giants in recent years were the disappointing Travis Beckham (2009 3rd round pick) and Robinson (2012 4th round pick). In free agency, the Giants let Kevin Boss walk in 2012 most likely due to a combination of salary cap and concussion concerns. His replacement Martellus Bennett was a good addition, but he departed in free agency the following offseason in 2013. Bennett’s replacement, Brandon Myers, was clearly a free agent mistake. Exacerbating the legitimate concern about the lack of headline talent was the adoption by the Giants of new offensive system that would feature the tight end position. In a West Coast Offense, the tight end is a critically important component as a pass receiver. Mini-camp, OTA, and training camp reports confirmed that new Offensive Coordinator Ben McAdoo’s system would not only rely heavily on the tight end, but often employ two- and three-tight end formations. The fullback position was marginalized. And rather than use more three- and four-wide receiver sets, the multiple tight end packages were more prominent. It began took as if McAdoo would not adapt his system to the strengths and weaknesses of the given roster. So pessimistic were many fans about the prospects for Donnell, Fells, and Robinson that they had penciled in Davis and Grimble as the two most likely to make the team. However, by late August, Davis and Grimble had been cut. Cunningham was cut too but then signed to the Practice Squad. Larry Donnell had won the starting tight end position, followed by #2 tight end Daniel Fells, and #3 tight end Adrien Robinson. Overall, while the tight end was not a position of strength on the 2014 New York Giants, it certainly was not the mess many had expected. Donnell had a breakout year as a receiver. He finished tied for 9th in the NFL among tight ends in terms of catches (63), 13th in terms of yards (623), and tied for 7th in terms of touchdowns (6). Blocking was not a strength of his game, but Donnell appears to be an ascending player with enough physical talent to get better. Fells proved to be less dynamic, but was more reliable as a blocker. And he did chip in with four touchdowns. Robinson remained buried in last place on the depth chart, but at least he finally saw some playing time and caught his first NFL touchdown. Larry Donnell went from a little-known player to the team’s primary tight end in 2014, playing in all 16 games with 12 starts. Donnell finished the season with 63 catches for 623 yards and six touchdowns. Donnell originally went undrafted and unsigned in 2011. 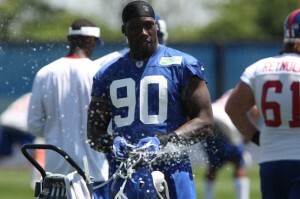 The Giants signed him as a street free agent in March 2012 and Donnell spent 2012 on the team’s Practice Squad. Donnell made the 53-man roster in 2013 and was active for all 16 games, starting one contest. He finished the season with only three catches for 31 yards. Donnell combines very good size and overall athleticism. A very raw player when he came to the Giants, Donnell is still a work in progress. In the passing game, Donnell is a big target, adjusts well for the football, and is capable of making the circus catch. He needs to do a better job of holding onto the football (four fumbles in 2014) and gaining yards after the catch. While Donnell gives a good effort, he still has a lot of work to do to improve as a blocker. Daniel Fells was the #2 tight end for the Giants in 2014. He played in all 16 games with nine starts and finished the season with 16 catches for 188 yards and four touchdowns. Fells was originally signed as an undrafted rookie free agent by the Atlanta Falcons after the 2006 NFL Draft. He has spent time with the Falcons, Raiders, Buccaneers, Rams, Broncos, and Patriots. The Giants signed Fells to a reserve/future contract in January 2014. Fells has good size and average athletic ability. He is a decent blocker. He does not really threaten defenses as a receiver, but he is reliable. Adrien Robinson has not developed as hoped since being drafted in the 4th round of the 2012 NFL Draft by the Giants. In 2014, he was the team’s #3 tight end and played in all 16 games with one start. Robinson only caught five passes for 50 yards on one touchdown. In the previous two seasons, Robinson only played in three games and had no catches. He missed virtually all of the 2013 season with a foot injury he suffered in the preseason. Robinson has a good combination of size and athletic ability, but to date he has been unable to put it all together at the pro level as a blocker and receiver. Jerome Cunningham was signed to the 53-man roster from the team’s Practice Squad in December 2014. Cunningham played college football at Southern Connecticut State University from 2009-2012, but he was not with an NFL team in training camp until August 2014 when the Giants signed him. He did try out with the Indianapolis Colts in May 2013 and Arizona Cardinals in May 2014, but was not signed by either team. Cunningham lacks ideal size for the position; he’s built more like an H-Back. But he is a good athlete who catches the ball well. August 17, 2014 New York Giants Injury Report: Four New York Giants were injured in the team’s 27-26 comeback victory over the Indianapolis Colts on Saturday night: CB Prince Amukamara (groin), S Cooper Taylor (foot/toe), OT Charles Brown (shoulder), and DT Markus Kuhn (elbow). Taylor sustained an injury to the sesamoid bone in his foot. Coughlin said Kuhn hyperextended his elbow but will likely be able to play with the injury. 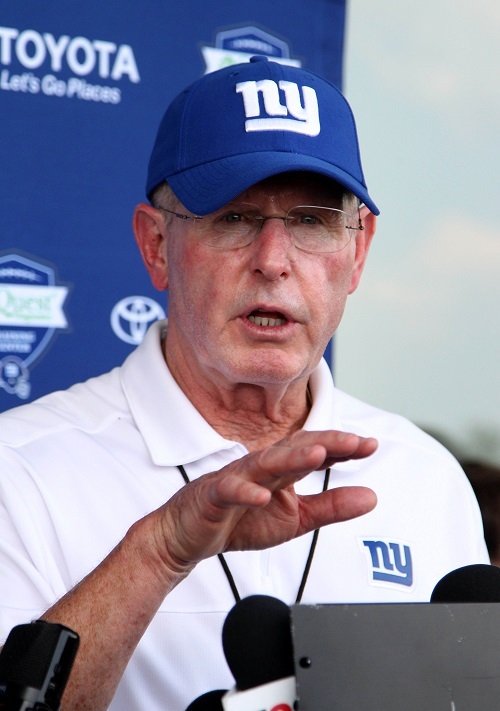 August 16, 2014 Tom Coughlin Post-Game Press Conference: The transcript of Head Coach Tom Coughlin’s post-game press conference on Saturday night is available at Giants.com. July 25, 2014 New York Giants Injury Report: LB Jon Beason (foot – PUP) and WR Odell Beckham (hamstring) did not practice. 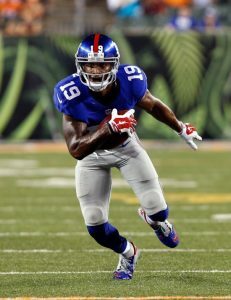 July 23, 2014 New York Giants Injury Report: LB Jon Beason (foot – PUP) and WR Odell Beckham (hamstring) did not practice. Beckham aggravated the same hamstring that bothered him in OTA’s and the mini-camp on the first day of practice on Tuesday. July 23, 2014 Jerry Reese Press Conference: The transcript and video from Wednesday’s press conference with General Manager Jerry Reese are available at BigBlueInteractive.com and Giants.com.